Members and guests of the Club got a VIP insight into the town’s new Kinnettles Hotel in the first event of the new season. General Manager Grant Cooper and his staff welcomed club members and their guests to the boutique hotel on North St, which opened in July. 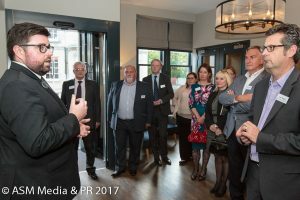 Grant explained the history of the project and some of the plans for the future before leading attendees on a guided tour of the facilities which include a luxurious suite, the state-of-the-art Eden spa and the Tayberry at Kinnettles restaurant run by award-winning chef Adam Newth. Members and guests also sampled some of its delights via delicious canapes! Unsurprisingly, this proved to be a very popular event.